Last week I wrote about the desperate need in education to look beyond the Common Core and into the Human Core, or the social and emotional well-being of all students. While there are countless non-academic competencies that are often left out of a standard school curriculum, I would argue that the most glaring absence is in the area of social and emotional intelligence. I’d like to introduce you to an emotional intelligence objective that may seem counterintuitive at first glance, but serves as a necessary component of social and emotional growth. 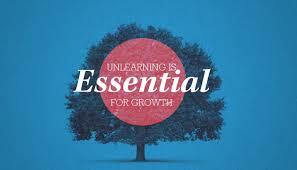 Students will demonstrate a willingness to unlearn what they’ve learned. His response serves as a perfect metaphor for the process of unlearning that I mentioned earlier. When I look into the eyes of toddlers (1-3 years old), I often see a world of infinite possibility and an unbridled curiosity for the world around them. Thoughts of doubt, shame, or guilt don’t even exist in their minds. Because they haven’t learned these concepts, the idea of not being able to do something is a foreign one. If you have a child, you know this all too well. How many times did he/she try to climb out of the crib, despite your countless instructions not to? Fast forward 7-10 years to the age of most of the students I work with. Why is it that many of these students exhibit behaviors that are consistent with low self-esteem? Why don’t they possess the same resiliency and absolute belief that was a trademark of their toddler years? The answer is simple. Throughout childhood, each of us received an education (directly or indirectly) with regard to our limitations. In other words, we learned who we could not be and what we could not do. Whether it was a television show that conveyed a message of inferiority or a friend who told you that you wouldn’t amount to anything, these messages ultimately serve as learning experiences which often lead to limiting beliefs such as “I’m not good enough.” While there is clearly no truth in this statement, it’s easy to accept it as the truth and subsequently use it to shape a future of doubt, guilt, or shame. Now let’s apply the metaphor in the story of Michaelangelo’s response to the creation of David. It’s clear that the finished product was a thing of absolute beauty and brilliance. However, let me remind you that Michaelangelo referred to this magnificent sculpture as something that was already concealed in the stone; it already existed. His job was to chip away at everything that wasn’t David. Just as Michaelangelo was able to chip away at the various layers of marble that represented who David wasn’t, we too can chip away, or unlearn, the various layers that prevent us from achieving our true potential. We are not doubt, fear, guilt, discouragement, or suffering. These all originated in the mind as a response to outside stimulus; we learned them. The unlearning process begins with a commitment to self-discovery and a willingness to change a set of beliefs that quite honestly have been running on auto-pilot for years. What thoughts do you have that may be holding you back? Consider for a moment that you’ve spent years learning (and reinforcing) these thoughts, so it may seem like they’re etched in your mind forever. Thankfully, this is far from the truth. I invite you to do as Michaelangelo did and start chipping away at who you’re not (limiting beliefs). Eventually, you’ll uncover your beauty and brilliance. The same beauty and brilliance you’ve possessed your entire life.